Regina Lynn Squires On August 12, 2009 we lost our beloved mother, companion, sister, daughter, friend, and the most amazing grandmother; Regina Lynn Squires. She passed away at Intermountain Healthcare Hospital in Murray, Utah from complications due to an aneurysm at the young age of 60. She was surrounded with love from her family, when Heavenly Father decided it was time for her to go. Regina was born on February 28, 1949 on Ellsworth Base Rapid City, South Dakota. Regina graduated from Davis High School in 1966. She had a few loves in her life; she had married Robert Dunlap in 1966, Earl Conley in 1972, and Gary Squires in 1990. My mother has been fortunate enough to spend the last 13 years of her life with her love, Jeff Close. Regina loved being involved in everything. She was honored to be a part of the 2002 Olympics. She volunteered her time at the deaf and blind school in Ogden. She would always be there for anyone, anytime, any day to help someone out. She had a heart of gold. Regina loved being in the mountains on her four wheelers with Jeff, her friends and her loyal dogs, Shadow and Sparky. She loved spending time with her daughter Stacey, helping her with anything, and being her best friend. Regina would travel anywhere to see her grandchildren; being involved with their sports, hobbies, graduations and all of their many activities. 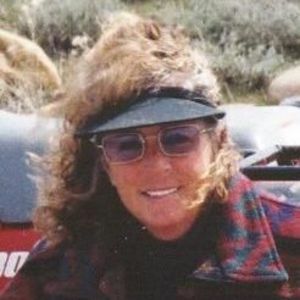 She enjoyed fishing, camping, skiing and snowmobiling with her friends and family. Regina also enjoyed spending valuable time at their home in Bern, Idaho. She has made so many friends, all those from Utah, and those from Idaho. She enjoyed working at WorldMark in Garden City, Utah. She has truly touched so many people in this world and will be deeply missed. Her grandmother, Alta Rano preceded Regina in death. She is survived by her companion, Jeff Close (Ogden, UT), her only daughter, Stacey (Ryan) Bateman (ID), parents, Marvel Edmiston (Kaysville, UT), Donald and Sharon Edmiston (AZ) sister, Kim Wood (Kaysville, UT), brother, Tracey (Tess) Edmiston (Kaysville, UT), four grandchildren, Trevor Ewing, Kelton Ewing, Shania Bateman, Jessica Bateman, and her dogs Sparky and Shadow. A celebration of her life will be held August 20th at 1 p.m. at the Harrisville Cabin, 725 West Harrisville Road. Because of her love for animals, in lieu of flowers, my mother would be honored for any donation to be made for The Weber County animal shelter. We would like to thank Bear Lake Memorial Hospital for helping assist my mother until transferred to Intermountain Health Care in Murray, where she received the utmost care. Thank you to all the wonderful Doctors and staff that took care of her. You are all truly amazing people. Because Regina was the most giving person, she gave the greatest gift after she passed away. She was able to give life to needed recipients. We will miss her so very much; she was and is a truly beautiful amazing person. We love you. My Grandma Marvel some how came across this today, and told me to look it up,,I hope you may come across this one day, I would love to tell you all about the wonderful beautiful amazing sister you never met, My mother was the best, I miss and love her more then anything...I know she wouldve loved to have meet you, If you come across this please feel free to look me up,,she was amazing,,,Im sorry she never meet you or was aware she even had another brother. I remember when I was in High school Bill WIlliams contacted my mother, i was with her..He mentioned to her she had a little sister, for some reason, he never contacted her again. However,,, I could share with you so many things about her. Im on facebook stacey conley bateman if you ever get this. I know he has thought of you ofter and it would have been nice if you could have known he loved you. I would like to send my sympathies for your loss. I have never met my sister but have thought about her all my life. I did not know how to go about looking for her and was sitting here with my mother so we tried searching facebook. My mother remembered her name and where she lived and we could not believe a picture of her came up..We have a picture of her when she was younger and one when Stacie was grown...She looks the same. I wish i could have had the opportunity to meet my sister, Her Dad, Arthur Williams is living here in Thomasville Georgia and doing well. Regina also has a brother named Tyler Williams. She seemed like a wonderful person and I will always miss my sister I never knew..
Dear Stacey,Jeff,"Shadow","Sparky" and families, The celebration of life ceremony for our friend "Gina" was absolutely beautiful. We are very honored to have known such a remarkable lady. Stacey you are so much like your sweet mother. She is so proud of you. She had so, much love to give us all. We had so much fun and alot laughs, out in the wilderness camping and at Bear Lake on the beach. We cared about her and loved her very much. Dear Stacey,Jeff,"Shadow","Sparky" and families, The celebration of life ceremony for our friend "Gina" was absolutely beautiful. We are very honored to have known such a remarkable lady. Stacey you are so much like your sweet mother. She is so proud of you. She had so, much love to give us all. We had so much fun and alot laughs, out in the wilderness camping and at Bear Lake on the beach. We cared about her and loved her very much. "The Memory of Gina and her sweet smile will always...be in our hearts. She will NEVER be FORGOTTEN." Until we meet again friend, we love you and miss you dearly. Sorry for the loss of your mother Stacey & Ryan,your daughter Marvel,your sister Kim,your grandma,Trevor,Kelton,Shania,Jessica,and to all of her friends.Regina was a very loving & caring person. I'am honored to have known her.She was a special part of my life I will never forget.I pray that all of you get through this loss. God bless. Gina has always been a great aunt, but we really got close when she and Jeff took me, allowing me to live with them for 2 years while attending college. I became very close to them, and I had such a great experience getting to know them; we laughed while Gina "helped" me with my math homework, cried while we watched Court TV, and had a ton of fun with those dogs. I am so happy that my life became better because of my aunt Gina, and I will cherish forever those special moments we shared. About 12 years ago on a Sunday afternoon I got a call – is this Kay from Kaysville, Utah? Well, this is Gina and I have been looking for you, and just like that, best friends re-connected like it was yesterday. We talked often, about the good times and the bad, memories and the future. You could always count on Gina to be there. Dave mentioned she had gone to a ceremony in Kaysville to add my brother’s name to the veteran’s memorial plaque. She was so excited to do that for me, and there she was front row center with her cell phone in one hand and her camera in the other. I was able to listen to the whole ceremony, after she talked with all the speakers and a week later here came the pictures. It was an amazing gift that she gave me, but that was Gina. She was a hard-working, loyal, passionate friend, who,loved life, family, friends,and dogs! Her laughter, humor, and approach to life endeared her to many and gave us memories we will cherish forever. She will like knowing that she was able to help others with her generous gift of life. Who knows, maybe parts of her will get to California! My thoughts our with the family, Stacy & Ryan, Jeff, Marvel, and the grandkids. I will miss our talks, I will miss Gina . . .